At Sierra IT Group we love cloud solutions. Unlike competitors such as Google Drive or Dropbox a personal business file cloud allows operation on private servers. Our high performance Business File Cloud solutions give you the ability to share your files with and co-workers in your organization and even with friends. Sync your files, data, videos, etc. cloud and access it from any device, worldwide. You can even use it as a backup solution for all your exisitng data - deployed onto your very own private cloud. As each business is different and has individual needs, we approach them with custom-tailored IT solutions. At Sierra IT Group Co., Ltd. we provide unique, high quality solutions that help us build long-term strategic partnerships with our clients. 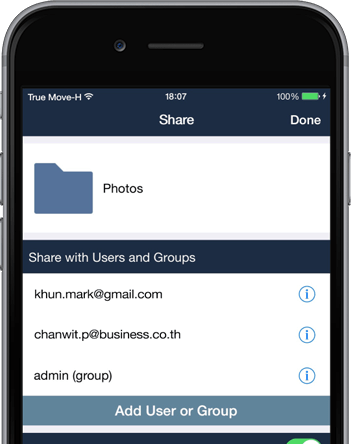 Add unlimited Users & share your favorite data, dates or contacts within your organization. Your box will be instantly deployed, secured, configured and up running in no-time. Up-to-date and accessible data, no matter where you are or which device you are using. Access your data worldwide from any mobile device, notebook, your desktop or web browser. Fully encrypted and secured data, firewall, antivirus and security checks for your safety. Backup your files in one place, restore them & keep them synchronized across all of your devices. Scale and resize your server anytime to handle the increase or decrease in your site traffic. Share information with co-workers or grant them access to business documents or any other files. Our team manages your box from a technical aspect, so that you may focus on your business. Are you looking for Cloud Storage & Backup Solutions? Is this solution suitable for me and my business?? 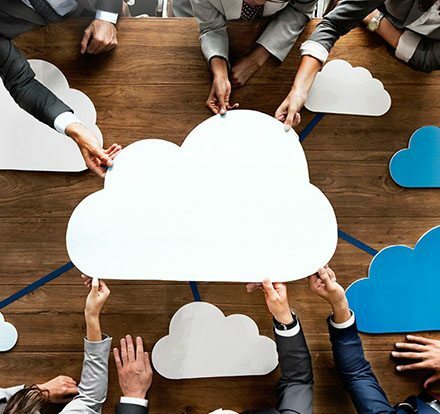 Our File, Storage and Backup Cloud solutions are suitable for businesses of any size that need a flexible and ultra comprehensive file sharing solution. With a wide range of options when it comes to collaboration and syncing, you can work on documents, spreadsheets or calendars online as a team without the problem of conflicting versions. There are also plenty of options for managing access rights, making it easy for administrators to customize and monitor the read and write access granted to employees. Moreover, there are additional benefits from the extra security compared to public Cloud services. Thanks to numerous security features, you no longer need to give up control of your sensitive files. Your Cloud instance will be instantly deployed ensuring you have total control over your files whilst also benefiting from the high security standards. Yes. When using Cloud services by Sierra IT Group, you benefit from extensive security features which keep your data protected. Public Cloud services often store your data on servers located all over the world, meaning they don't need to comply with stringent data protection laws. When opting for Sierra IT Group as your reliable cloud-file partner, you can rest assured that all data is stored in data centers that ensure the utmost reliability and compliance with the strictest data protection guidelines. Our Cloud solutions offer elevated technology smf comes with numerous additional security features to protect your files from unauthorized access and malware: you can protect links to parts of your files with an expiry date and also secure sensitive documents with a password. Administrators also have the option of assigning user access rights on an individual basis, which can be adjusted at any time. If you require even more security, you can also set up two-factor authentication—meaning that users are only able to access the Cloud if they have a password, access token and username. On top of that we offer additional security measures such as an SSL certificate. Can I access data when I am travelling? Yes, absolutely. Your Cloud instance can be accessed from any standard device as well as web browser access, there are also numerous apps and clients available. You can access your Cloud via Android or iPhone or from your Desktop or notebook computer with Windows, Mac or Linux. Thanks to the file firewall, you do not need to worry about accessing your Cloud via devices outside of the corporate network: the firewall sets complex rules for access, such as the IP addresses, devices or geographic locations from which access should be permitted. Based on these and other additional criteria, you can restrict access at your own discretion, in line with your company's security requirements. This ensures that only authorized employees have access to files—from anywhere in the world. You can then carry out international projects, allow your employees to work from home, and to access important files whilst away on business. There is always the possibility that something can happen but I was feeling that it would never happen to us because we never had a hard drive crashing before, but one day it did, resulting in over 5 years of data being deleted. After learning this lession the hard way we decided to opt for a business cloud solution by Sierragroup. Now we can work safe and securely without loosing any of our business data. Working with data from the cloud has many advantages and this solution was the perfect choice for my business as staff from abroad needs to access critical data in real-time. The staff at Sierragroup seems very technical and reliable. A great Bangkok based company with a brilliant team. I cannot recommend them enough!